Soft, comfortable, antibacterial Silver Steps™ diabetic socks keep diabetic feet dry and cool while helping to improve circulation. 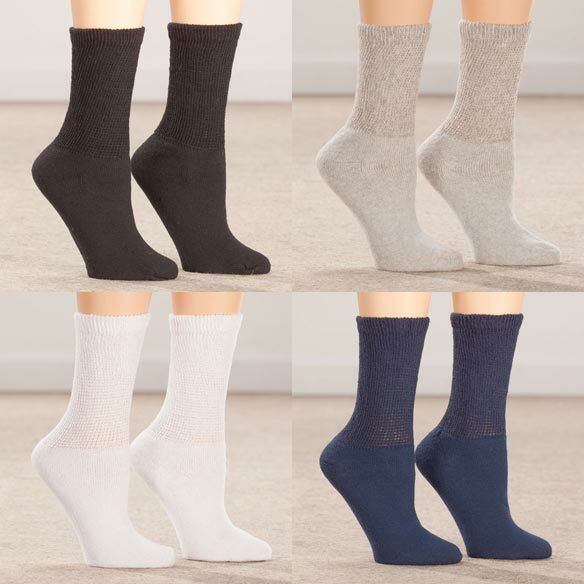 With a non-constricting fit and easy-stretch band, these support socks are ideal for those with circulatory problems, edema, neuropathy or diabetes. Choose from 6 colors: white, grey, black, brown, navy or tan. 85% cotton/5% spandex/10% polyester (white, gray, tan socks) or nylon (black, brown, navy socks). Machine wash warm; tumble dry warm. Non-chlorine bleach and low iron if needed. These socks are extremely comfortable, no binding and not too tight. They come in a variety of colors so they match anything. A big plus is they are made in the USA! Wear well, do not cord legs. These socks fit just right. They don't bunch up under my foot while I'm walking or leave elastic marks on my legs. I'm pleased with them and would buy them again. I'm also glad that they're made in the USA! Soft, warm socks, just as described. My legs and feet feel great after wearing them all day. Haven't washed yet, but I'm sure they will hold up. Made in the USA, which I like. Being disabled and a diabetic senior, its mighty important to have things fit properly and have comfort. These fit the bill! Their soft and large enough not to bind, great fit. I will continue to purchase these socks. The socks are warm on the feet. and very comfortable. These socks are wonderful and just what I needed with fragile feet and legs. They are very comfortable and I just like the way they feel. No slipping down the leg. Socks that dont leave marks on my legs because of swelling. Most comfortable I've ever worn! Very, very soft and not tight whatsoever. I ordered one size larger than I normally wear but the regular size would have been just fine. Laundered 3 x without any discernable shrinking. I purchased both anklet and this longer version. I think this one is ideal for me. Thank you Walter Drake! My order was perfect and the shipping was right on. I love these socks. I have always had trouble with the top of the socks digging into my legs. These made for diabetics do not do that. I wear jeans a lot since I am retired now and I love having the navy socks. Best socks I've ever had. Really stand up over time. Even thou I can't swear by them because of your prudes in your outfit. I haven't washed them yet, so I don't know how they hold up. I love my socks . I have a very sore foot from an infection and they are perfect. I HAVE USED THESE SOCKS FOR SEVERAL YEARS. I USUALLY WEAR THEM OUT BECAUSE I WEAR THEM EVERYDAY. THEY ARE EXTREMELY COMFORTABLE WHEN WORKING OUT OR WALKING AND GREAT FOR DIABETICS. I JUST BOUGHT 2 ADDITIONAL 3 PAIR PACKS IN BLACK AND GRAY. My 95 year old mother-in-law loves them! My mother-in-law was wearing sox that were cutting her calfs leaving marks. Her feet were always cold because her circulation was being cut off by her sox. I bought her these sox and she loves them. Glad I found them! I have trouble with socks fitting my wide calves but these are great. Also, I liked having more choices than just black or white. Will be wearing these socks in cold weather. Labeled for diabetics but they are comfortable for anyone. Not too tight. I'm getting these in multiple colors. They are comfortable, non-binding at the top, and not too bulky. I just wish they had seamless toes. If I had known these socks said USA at top of sock, I would not have gotten them. I love the United States of America. I am referring to the sock itself. I apparently bought these previously, but forgot. These socks leave deep indentations on my lower legs after 15 minutes of wearing, so I am very upset because they are called Diabetic Socks. They cut off my circulation very badly and I had to remove them quickly. I am not diabetic but have issues with my feet due to neuropathy and circulation problems. I ordered this sock several months ago and because of its softness and fit found it very satisfactory. When I placed this last order I had a concern because the price was lower and asked if the quality had remained the same. I was assured it had. The quality is not the same and the sock provides no more comfort than any of the others I have tried. There is extra elastic band/cuff at the top of these socks that leave a deep crease on my leg when I wear these. Not good at all for swollen legs. It shows in the picture but I didn't notice it before I ordered. My husband likes them because they are comfortable. I needed compression socks -- these are an excellent price. They are comfortable and reasonably priced. I bought this product before for my husband, he liked it. So now I bought a dozen more.The sox wash well. 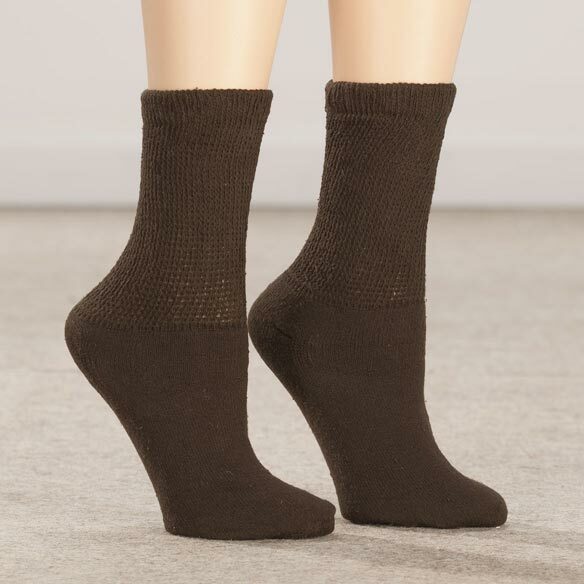 looking for socks that do not go up so far on the leg, prefer only 4 or 5 inches. I've been looking for some new socks so I'm trying these. The socks looked comfortable. Comfort is important to me. I wanted soft crew socks in many different colors. Bought these for my Mom who is a senior with circulation problems and swollen feet. The socks help to relieve muscle pain. I needed black or navy blue socks, but at the department stores, I can find only packages of three, two being colors I can't use. Repeat buyer of this item . Have diabetes and neurothapy, and I noticed since I wear socks (regular socks) that my feet and legs feel a lot better, so I want to try these socks. I feel they will really be good. High cotton content, so feet will breathe well. They are easy for my husband and me to put on. Bought a package of these socks for my husband and he loved them so I ordered him more . I liked the type of material the socks contain. Hope mom will enjoy the plush option of these socks. I buy them for my mom and she loves them so I will try them for me. What size should I get the diabetic socks for a man who wears a size 9 1/2 shoe? BEST ANSWER: Thank you for your question. For a 9 1/2 mens shoe, we suggest to get the Healthy Steps 3 Pack Diabetic Socks in a size Large. We hope this information will be of help to you. What size is XL? In the Dieabetic socks? BEST ANSWER: Thank you for your question. The XL for the Healthy Steps 3 Pack Diabetic Socks is 13-15 in women's and 10-13 in men's. We hope this information will be of help to you. Is the foot area heavier than the top of the sock? BEST ANSWER: Yes, it seems to be. The foot area is very comfortable and the top stays up well, without cutting of the circulation in my calf. yes, My father had worn these for about 4 years, they were easy for him to get one top of sock was very soft . How wide does the top of the sock stretch at the calf? BEST ANSWER: Very wide. They are perfect for a big calf. Extremely comfortable. And long lasting. Hope this helps. 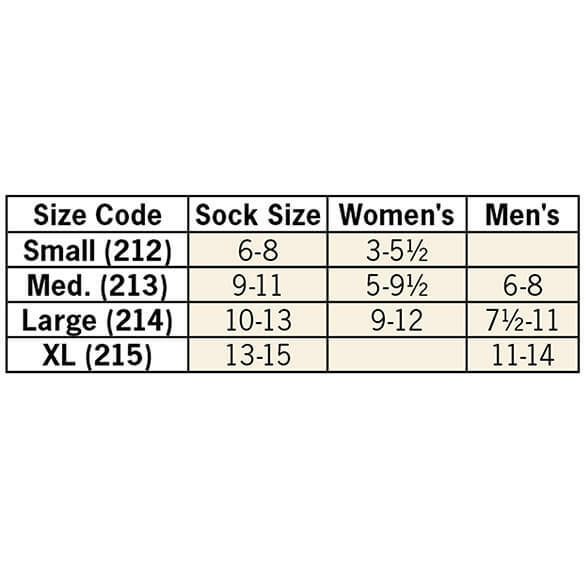 size chart for socks ? BEST ANSWER: Thank you for your question. There is a tab above the item description for the size chart. We hope this information will be of help to you. what size is large inshoesize? BEST ANSWER: Thank you for your question. The Large is women's 10-13 and a men's 9-11. We hope this information will be of help to you.